The new Harvest Moon Café and Yordie’s Zen Garden is about as complete as I can make it. It is the culmination of maybe three months of part-time tinkering, but it was very enjoyable to create. As with every one of my Japanese projects, I’m not satisfied with the results but by putting the work into perspective against other gardens, I am happy with the result. I’ve spent some time this week trying to prepare something resembling a geisha show, but I just don’t have the time to put together a proper show. So, I’m using my alt to play music on the koto while I put on a dance demonstration. I hope this little performance will give guests a sense of what an actual geisha show might look like on the ochaya’s small stage. 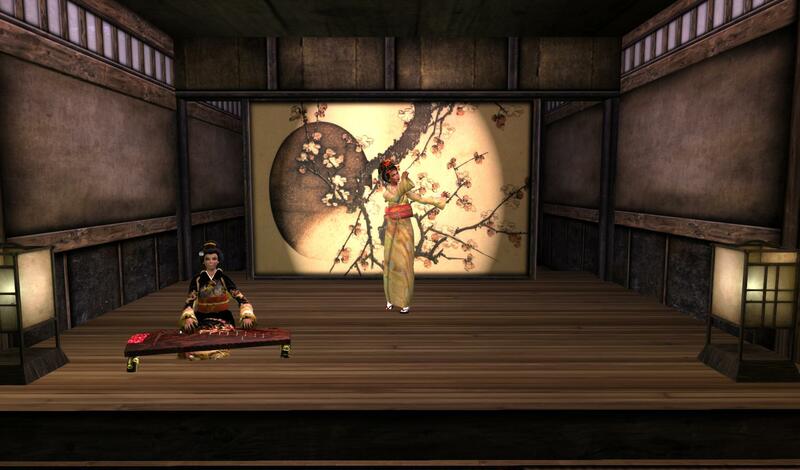 and beautiful geisha Yordie stars as the lead dancer at the new Harvest Moon Café. My alt has been given the screen name “Suzuki” in honor of my days in Yoshiwara Okiya, but please don’t expect her to have anything to say because she’ll be running on my laptop while I perform on my desktop. and I added the stage by taking another POST structure and modifying both. This will be a very informal opening of the garden. I’ll be inviting friends throughout the weekend to come and visit. I plan to be at the garden for several hours on Saturday and Sunday, then again other times this month before I take the build down in September. 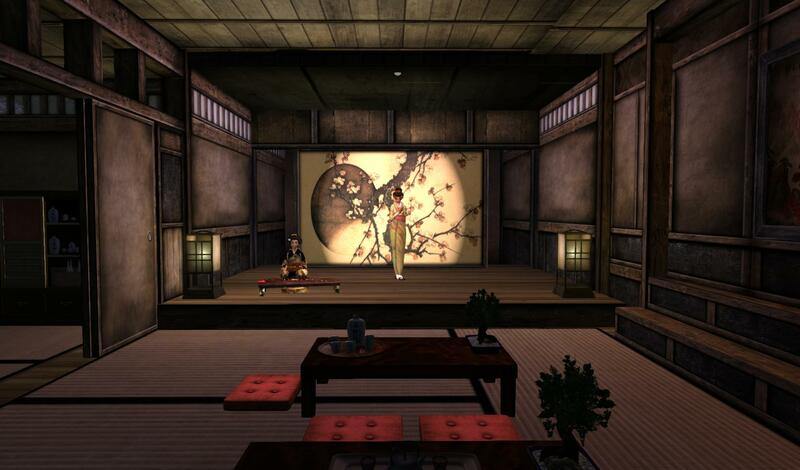 This entry was posted in Features and tagged Events, Geisha & Samurai, Photography, Role Play, Zen Gardens. Bookmark the permalink. I’ll IM you later too, but in case that idea falls though one the swiss cheese holes in my brain lately, then please make sure to give me all the details – I want to see this! I’ll be around much of the weekend and the build will be open for the rest of the month, so no worries.